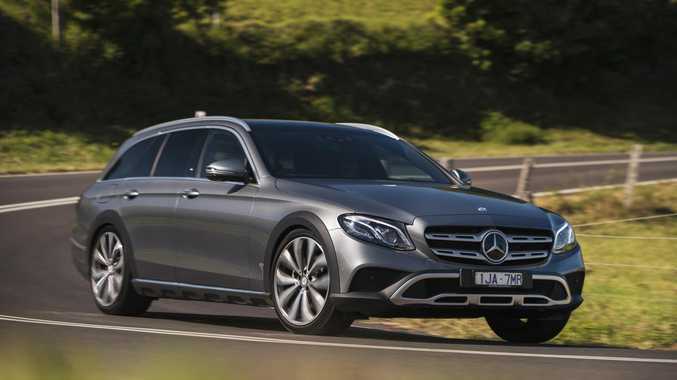 The popularity of SUVs means Mercedes-Benz is only selling one E-Class wagon in Australia - and that has been tailored to emulate the soft-roaders' strengths of all-wheel drive and elevated suspension. The E220d All-Terrain can, depending on your needs, act as luxurious five-seat transport, haul loads of up to 1820L with the rear seats folded, or tackle most gravel roads courtesy of 29mm extra ride height over a regular E sedan. It doesn't take a trainspotter to work out this Benz has a unique twin-blade grille and black plastic body cladding to differentiate the All-Terrain from run-of-the-mill Mercedes. The interior is typically E-Class but Benz has added a lot of standard gear over the comparable diesel sedan including adaptive LED headlamps, a kick-to-open electric tailgate and full leather upholstery with heated front seats. It is also loaded with software and airbags to keep you on the road or as insulated as possible if you do have a shunt. A list price of $109,900 winds out to about $123,724 drive-away for the All-Terrain. That's a $15,000 impost on the rear-wheel drive E220d sedan and is $1000 dearer than the bigger-booted and bigger-engined GLE 350d. The All-Terrain justifies the price with AWD, more equipment and air suspension over the E sedan, while the ride is more settled and the interior is prettier than inside a GLE. 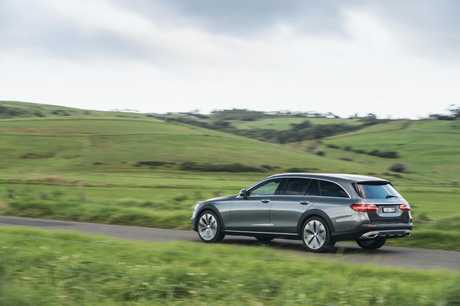 Some will find the wagon fits the bill but even Benz admits the All-Terrain is a niche product. Audi's A6 Allroad, built on the same premise, is a marginally more expensive but demonstrably more powerful machine, its V6 turbo diesel (160kW/500Nm) good for a low six-second run to 100km/h, against the Benz's 2.0-litre diesel (143kW/400Nm) taking eight seconds. Throw in the Audi's thriftier claim, 5.6L/100km against the Merc's 5.7L, and it is the performance pick. Benz opted for the four-cylinder rather than a six because most buyers of the last generation went for the smaller displacement donk. Benz's air suspension is a great match for the wagon. Beyond default ride height, the bags can be inflated to lift another 20mm at under 35km/h when off-road. In any mode, from comfort to sport, the cushions absorb the worst Australian roads can dish up. There is some faint kick from sharp-edged potholes on the standard 20-inch rims but it's minor. The steering is light without lacking precision and the diesel engine will come close to matching its claimed fuel use in the real world, largely because auto's nine speeds give the transmission software plenty of scope to balance the competing demands of acceleration and efficiency.